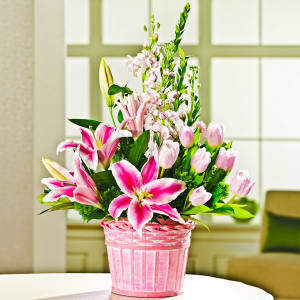 Send caring thoughts with a lovely pink arrangement in a pink woodchip basket. • Designed with tulips, lilies, stock, trachelium, myrtle and salal. 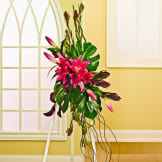 • Measures 25"H x 19"W x 14"D.
Flowers will be received by a Kona Memorial Park's staff. 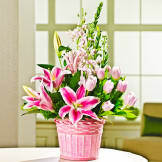 All of our flowers are designed and delivered by hand from a local florist in in Holualoa.